Incalmo vessels by Tapio Wirkkala for Venini. In this post, we will explore one of the classical techniques of glass art. 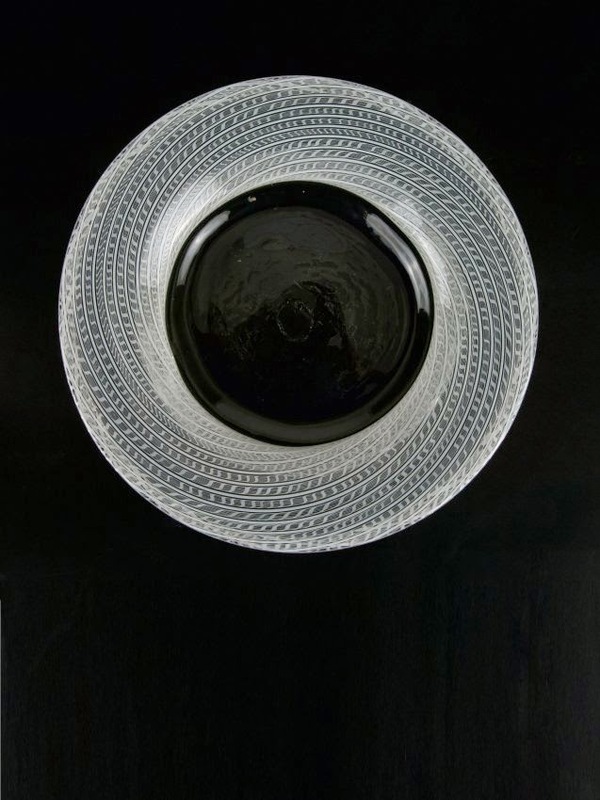 Along with filigrana, latticino, reticello and pezzato, incalmo is a classical Venetian technique well established in the art, even if poorly understood by many outsiders. ‘Incalmo’, in Venetian dialect literally means “graft” as in joining two plants. That is a pretty good description of how this effect is achieved; think of a vase whose bottom-half is one color and top is another. The glass artist blows two separate bubbles of glass, opens them and joins them together to form a single bubble. It is a difficult operation because the two open lips must be exactly the same size to join properly. The process can be continued to add more colors; virtuoso pieces may include several sections, each a different color. In addition, the position of the iron rod that the artist uses to hold the bubble can be changed while the piece is under construction, leading to asymmetrical effects. The above description is the classical way of achieving incalmo, but modern materials and equipment allow artists to achieve a similar effect with considerably less skill. For instance, precise diameter glass tubing is now available in a wide variety of colors. This can be cut into rings with a saw, then stacked in a kiln and fused together. From there, this “prefabricated incalmo tube can be worked by traditional methods. Whether or not this meets the definition of true incalmo depends entirely on whether one focuses on the method or on the end result. The name ‘incalmo’, was applied to glass in the first half of the twentieth century by the Venini factory on Murano, in Venice. However, both the word and the method are much older. The Venini artisans revived the technique to great acclaim, but Venetian examples date from the sixteenth century and Islamic examples from ninth century Syria have also survived. 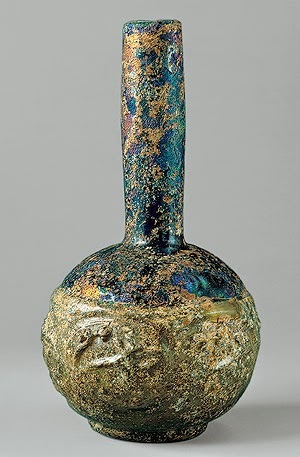 It is not hard to imagine that this joining technique was experimented with shortly after glassblowing became common around the first century BCE. However, what is truly amazing is that any of these early examples survived to be sold to customers without breaking in the cooling process. The reason for this is a technical issue that we have not discussed yet. All glass expands a little when it is heated and shrinks when it cools. Different formulations of glass generally expand by differing amounts. When a single piece incorporates more than one type of glass, and the thermal expansions differ significantly, the result is disaster. After the piece is finished it is placed in a kiln where it slowly cools back to room temperature. Because of the mismatch, one area wants to shrink more than the adjacent area and the glass cracks along the join. The expansion and contraction is microscopic, but it is enough to ruin hours and hours of work, leading to much gnashing of teeth the morning after, when the finished work is inspected. The Venini glass masters had the benefit of this knowledge, but for earlier artisans, trial and error must have played a big role in determining which formulas were compatible. Different colors mean different metallic additives and to match expansion other ingredients would need to be adjusted. 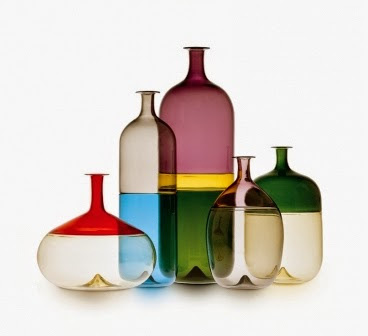 Today, manufacturers produce glass in a series based on expansion; artists can be relatively sure that two different colors from the same series can be “grafted” and not self-destruct when cooled. 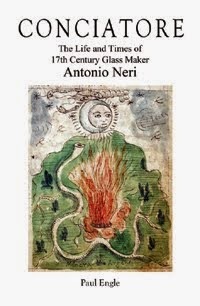 I have not absolutely confirmed this, but authoritative secondary references credit Venini, and I can find no mention to "incalmo" as a glass technique prior to the twentieth century.